Location: Le Bignon-du-Maine, in the Loire-Atlantique departement of France (Pays de la Loire Region). Ownership / Access: Louis Guays des Touches. Notes: The Manoir de la Chesnelière is a building located in Saint-Christophe-du-Luat, France.The fortified gate and the building on its left are inscribed as historic monuments since December 10, 1927.The estate of Clavières was acquired in 1833 by Louis Guays des Touches, judge of Laval, married in 1827 to Reine Blanche Bucher de Chauvigne (1803-1868), he built a castle with a chapel there. 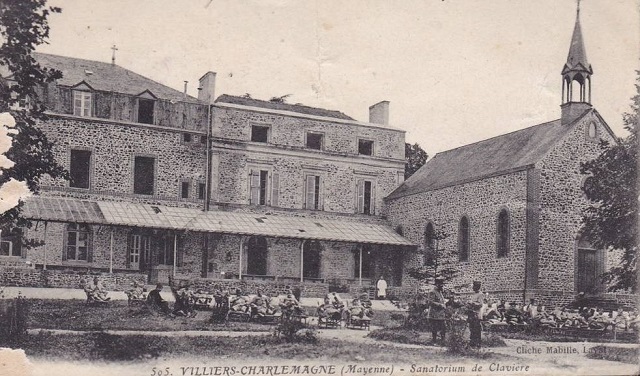 His son Auguste Guays des Touches (1828-1874) bequeathed his castle of Clavières to the seminary of Laval in 1874, on condition that a daily Mass be celebrated in the chapel where his burial and those of his parents are. The brothers of Saint-Laurent-sur-Sèvre accepted in 1875 the proposal to establish a novitiate there, the castle becomes the house of studies of the brothers of St. Gabriel. In 1882, the novitiate was replaced by a juniorate, two bodies of buildings were added in 1891-1893, to receive a scholasticate there in 1896.